I have decided to start a new series here, introducing readers to older and newer authors who have a valid claim to be considered representatives of that authentic Liturgical Movement to which this blog has been contributing for years, and of which Pope Benedict XVI is the greatest recent exponent. 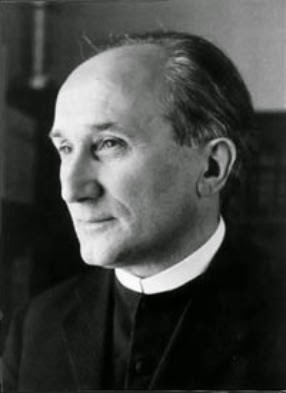 The mention of Pope Benedict reminds us, of course, of his great teacher, Romano Guardini, who is a sort of grandfather of NLM. So famous an author, with so many wise and penetrating books to his credit, hardly needs an introduction. It may be as well to admit that Guardini, like most modern Catholic authors, is not always reliable or sound on certain points, but when he’s on, he’s really on. The excerpts presented below, from chapter 1 of The Spirit of the Liturgy, are just a taste of the exquisite insights one can find in his work, particularly when he is writing on the liturgy, which he loved so ardently. Indeed, I prefer to think that certain problematic practical applications with which his name is connected were the result more of a misjudging zeal for sharing the riches of the Church’s liturgy than of a considered desire to modernize or transmogrify it, and it is obvious that he would have been sorely disappointed in the postconciliar collapse of the liturgy, the stripping of its symbols, the reduction of its majesty, the evisceration of its eloquent prayers and gestures, and the general loss of the awareness of the sacred, a category central in his thinking. When we read the best of Guardini, we seem to hear, as from a distance, the future coming of Joseph Ratzinger and the unsurpassed writings on the theology of the liturgy that Pope Benedict the Great (for he, in truth, deserves such a title) would bequeath to the Church, as a heritage that can vie with the golden age of the Fathers. Without further ado, let us hear some excerpts. The Catholic liturgy is the supreme example of an objectively established rule of spiritual life. It has been able to develop kata ton holon, that is to say, in every direction, and in accordance with all places, times, and types of human culture. Therefore it will be the best teacher of the via ordinaria—the regulation of religious life in common, with, at the same time, a view to actual needs and requirements. The significance of the liturgy must, however, be more exactly defined. Our first task will be to establish the quality of its relation to the non-liturgical forms of spiritual life. The primary and exclusive aim of the liturgy is not the expression of the individual’s reverence and worship for God. It is not even concerned with the awakening, formation, and sanctification of the individual soul as such. Nor does the onus of liturgical action and prayer rest with the individual. It does not even rest with the collective groups, composed of numerous individuals, who periodically achieve a limited and intermittent unity in their capacity as the congregation of a church. The liturgical entity consists rather of the united body of the faithful as such—the Church—a body which infinitely outnumbers the mere congregation. The liturgy is the Church’s public and lawful act of worship, and it is performed and conducted by the officials whom the Church herself has designated for the post—her priests. In the liturgy God is to be honored by the body of the faithful, and the latter is in its turn to derive sanctification from this act of worship. It is important that this objective nature of the liturgy should be fully understood. Here the Catholic conception of worship in common sharply differs from the Protestant, which is predominantly individualistic. The fact that the individual Catholic, by his absorption into the higher unity, finds liberty and discipline, originates in the twofold nature of man, who is both social and solitary. Now, side by side with the strictly ritual and entirely objective forms of devotion, others exist, in which the personal element is more strongly marked. To this type belong those which are known as “popular devotions,” such as afternoon prayers accompanied by hymns, devotions suited to varying periods, localities, or requirements and so on. They bear the stamp of their time and surroundings, and are the direct expression of the characteristic quality or temper of an individual congregation. The first and most important lesson which the liturgy has to teach is that the prayer of a corporate body must be sustained by thought. The prayers of the liturgy are entirely governed by and interwoven with dogma. Those who are unfamiliar with liturgical prayer often regard them as theological formulae, artistic and didactic, until on closer acquaintance they suddenly perceive and admit that the clear-cut, lucidly constructed phrases are full of interior enlightenment. To give an outstanding example, the wonderful Collects of the Masses of Sunday may be quoted. Wherever the stream of prayer wells abundantly upwards, it is always guided into safe channels by means of plain and lucid thought. Interspersed among the pages of the Missal and the Breviary are readings from Holy Scripture and from the works of the Fathers, which continually stimulate thought. Often these readings are introduced and concluded by short prayers of a characteristically contemplative and reflective nature—the antiphons—during which that which has been heard or read has time to cease echoing and to sink into the mind. The liturgy, the lex orandi, is, according to the old proverb, the law of faith, the lex credendi, as well. It is the treasure-house of the thought of Revelation. This is not, of course, an attempt to deny that the heart and the emotions play an important part in the life of prayer. Prayer is, without a doubt, “a raising of the heart to God.” But the heart must be guided, supported, and purified by the mind. … Only thought is universally current and consistent, and, as long as it is really thought, remains suited, to a certain degree, to every intelligence. If prayer in common, therefore, is to prove beneficial to the majority, it must be primarily directed by thought, and not by feeling. It is only when prayer is sustained by and steeped in clear and fruitful religious thought, that it can be of service to a corporate body, composed of distinct elements, all actuated by varying emotions. We have seen that thought alone can keep spiritual life sound and healthy. In the same way, prayer is beneficial only when it rests on the bedrock of truth. This is not meant in the purely negative sense that it must be free from error; in addition to this, it must spring from the fullness of truth. It is only truth—or dogma, to give it its other name—which can make prayer efficacious, and impregnate it with that austere, protective strength without which it degenerates into weakness. If this is true of private prayer, it is doubly so of popular devotion, which in many directions verges on sentimentality. Dogmatic thought brings release from the thralldom of individual caprice, and from the uncertainty and sluggishness which follow in the wake of emotion. It makes prayer intelligible, and causes it to rank as a potent factor in life. If a prayer therefore stresses any one mystery of faith in an exclusive or an excessive manner, in the end it will adequately satisfy none but those who are of a corresponding temperament, and even the latter will eventually become conscious of their need of truth in its entirety. For instance, if a prayer deals exclusively with God’s mercy, it will not ultimately satisfy even a delicate and tender piety, because this truth calls for its complement—the fact of God’s justice and majesty. In any form of prayer, therefore, which is intended for the ultimate use of a corporate body, the whole fullness of religious truth must be included. Individuals, or short waves of enthusiasm, can to a wide degree dispense with learning and culture. This is proved by the beginnings of the desert Orders in Egypt, and of the mendicant friars, and by holy people in all ages. But, generally speaking, a fairly high degree of genuine learning and culture is necessary in the long run, in order to keep spiritual life healthy. By means of these two things spiritual life retains its energy, clearness, and catholicity. Culture preserves spiritual life from the unhealthy, eccentric, and one-sided elements with which it tends to get involved only too easily. Culture enables religion to express itself, and helps it to distinguish what is essential from what is non-essential, the means from the end, and the path from the goal. The Church has always condemned every attempt at attacking science, art, property, and so on. The same Church which so resolutely stresses the “one thing necessary,” and which upholds with the greatest impressiveness the teaching of the Evangelical Counsels—that we must be ready to sacrifice everything for the sake of eternal salvation—nevertheless desires, as a rule, that spiritual life should be impregnated with the wholesome salt of genuine and lofty culture. The internal revival of the Catholic community will not make progress until the liturgy again occupies its rightful position in Catholic life. And the Eucharistic movement can only effectually distribute its blessings when it is in close touch with the liturgy. Certainly the grace of God is self-sufficient; neither nature nor the work of man is necessary in order that a soul may be sanctified. God “can awaken of these stones children to Abraham.” But as a rule He wishes that everything which belongs to man in the way of good, lofty, natural and cultural possessions shall be placed at the disposal of religion and so serve the Kingdom of God. He has interconnected the natural and the supernatural order, and has given natural things a place in the scheme of His supernatural designs. From chapter 1 of The Spirit of the Liturgy. Trans. Ada Lane (New York: Sheed & Ward, 1935). Amazon link.